West Virginia is an underrepresented state in terms of the number of students who study abroad. Prior to the creation of the Fulbright Advising office at Marshall University, students had received a few study abroad awards back in the 1960s, but then literally nothing until 2015 – just before I was hired. That year, a student applied and received a Fulbright English Teaching Award (ETA) to teach in the Slovak Republic—this was the first Fulbright student award we had had in 48 years. Despite this, I saw many connections between the character of my student population and the mission of Fulbright. Encouraged by the ETA award success, I heavily promoted the Fulbright Program on campus. 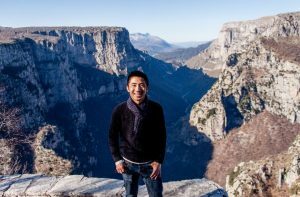 Fulbright’s mission of cross-cultural exchange fit my students’ drive and desire. During the first year that my office was in operation, I had one applicant. He applied to a highly competitive UK Partnership Program. This was our first study/research application in years and there we were—advancing forward in the competition already. Sadly, right after his semifinalist notification came word that the UK school involved in his proposed partnership was doing away with the degree program—and that was that. Nonetheless, I used that small success to promote the program more. “Look, we had one applicant last year and he advanced in one of the most competitive programs. You can do this,” I found myself saying over and over again to my students. My mission was to convince my unicorns they were really unicorns—by talking to them about their stories and showing them how they fit with Fulbright’s mission. The next year, I had an outstanding student who was incredibly interested in a Fulbright award in Ireland. Hailey Hughes, an English major who was also interested in using disability studies in her creative writing, wanted to apply. We worked diligently for months on her application. Her professors approached me regularly, asking,“Have you heard anything? When will she find out?” It seemed like half the campus was invested in the student’s application. That year, I had two applicants. The Fulbright snowball was rolling. Once again Hailey advanced to semifinalist status. Then, in early April, we received notification Hailey had received the award. She was the first study/research winner my institution has had since 1967. 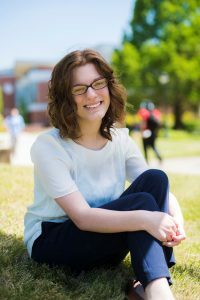 People will see Hailey as a representative of the Fulbright Program and will get a glimpse of what West Virginians and people with disabilities can accomplish. To date, I’ve had double the level of interest in Fulbright applications for this year’s cycle. I can’t wait to see where it’ll go from here. When I describe my year in Greece, I often feel like I’m describing a place I imagined rather than a place that actually exists. It is a place where golden light strikes marble columns and sparkles over the wine-dark sea; where rowdy, curious, and clever characters drink and dance; where tradition and innovation, creativity, and chaos brew in a social and economic cauldron. As a fiction writer with an admittedly tenuous grip on reality, I’ve inhabited Greece the way a reader inhabits a book. 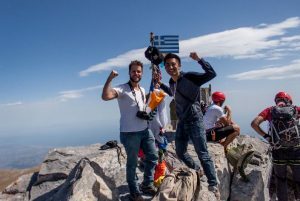 “Reading” Greece this year has reawakened my senses and bound me to Greek and Syrian people whose mythic stories have challenged what I thought I knew about the crises, and what I thought I knew about myself. I may be the newest reader of a book that spans millennia, but like Byron, Fermor, and Merrill, I’ve found a home in this country and hope to contribute to its pages. The Vikos Gorge from the Beloi Lookout in Vradeto, supposedly the deepest gorge in Europe. I came to Greece through its mythology, intrigued by a people whose gods were as raucous, petty, and vindictive as they were noble and just. The landscapes of Greece retain the mystery and power of mythology. Thanks to Fulbright, I’ve visited many of these places, where our world still seems to touch the world of the gods. I’ve walked along the Acheron River – the “River of Woe” – whose spectral blue waters seem colored by the spirits of the dead. I’ve listened for prophecy in the rustling oak leaves at Dodona and felt stalactites drip onto the back of my neck as a silent boatman ferried me through the caves at Diros. I’ve retraced Odysseus’s homeward path through the Ionian Islands and paid tribute to monsters Hercules had slain in the Peloponnese. Some days, traveling alone and outside my comfort zone, I walked on the edge of fear, knowing that beyond fear is awe, or δέος, the proper attitude for approaching the gods. I saw δέος on a Naoussan boy’s face during Carnival when he put on the wax mask of the γενίτσαρος for the very first time. I learned to play Trex in UNHCR hotels and befriended an amorous Iraqi who had lost his legs as a child. My students at Aristotle University of Thessaloniki shared their yiayias’ spoon sweets and their own stories of first love, of coming out, of overcoming anxiety, of living with HIV. I visited their hometowns, stations of my Syrian friends’ wayward journeys. I know which cheeses each island produces and for which dessert each village is famous. Everyone I’ve met breathes a bit of Greece into me, and their life stories take root in my imagination.￼ Now initiated into Greek culture, I’m eager to soak up every bit of history and myth, new local food, new tradition. 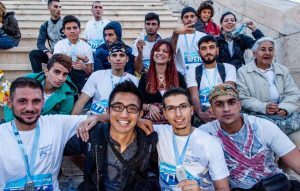 At Kallimarmaro Stadium with the Solidarity Now team, the first refugee team to run in the Athens Marathon. A monk on Mount Athos gave me this advice: To write distinctly, live distinctly. In Greece I learned a different way to live. I’ve always held myself apart from people, but here, I was expected to spill into other people’s lives, to reach over them for food, to let myself need and be needed by them. Friends who have visited me in Greece say that I speak louder in Greek, that I’m more willing to talk to strangers, more willing to ask for help. They notice how Greek people open up to me when I speak the language. When a Greek asks me if I’m part Greek, I respond, Ναι, η καρδιά μου είναι ελληνική, “Yes, my heart is Greek.” Completing my Fulbright year is a bittersweet accomplishment, like coming to the of a beloved book. But as Greece has become part of me, so has my experience become part of the story of Greece. Some experiences change the trajectory of your life forever. For Tanya Wacholz, that experience was a trip to China to visit the sister school of her Minnesota high school. “At the time, I didn’t know anyone who traveled abroad or lived in other countries,” she recalls, “and there I was in Tianjin and Beijing, meeting people whose cultures were so different and exciting.” Later, in college at the University of Minnesota, Tanya became interested in German and spent a semester in Freiburg, Germany, studying post-war history and German colonialism. After graduation, she moved back to Germany, this time to Berlin, in order to improve her German language skills. Considering a career in education and looking to gain experience, she applied for and received a Fulbright English Teaching Assistantship to help 12th- and 13th-grade students in Birkenwerder, Germany, prepare for the Abitur, their all-important cumulative exams. Following her Fulbright ETA, Tanya returned to Minnesota and taught through Teach For America in the Minneapolis area. Says Tanya, “I came home with the same mission that I had when I started my Fulbright experience–to become a teacher. I felt prepared to take on a new challenge. I felt ready to run my own classroom, and I knew what I wanted my classroom to feel like. I knew TFA was going to be a challenge, but I was prepared.” Through TFA, Tanya earned her Master’s degree and championed equity for all students in her classrooms. To that end, and due to a partnership between Reach the World and Teach for America, she became a Reach the World teacher herself, welcoming the next wave of Fulbright scholars into her classroom through their own virtual exchanges. “My students are so engaged when their traveler is on the screen right in front of them, sharing their experiences in a new place,” she says. Tanya’s 8th-grade English Language Learner students at Hiawatha College Prep often have international backgrounds themselves, so they’re especially interested in what languages their Reach the World traveler speaks. 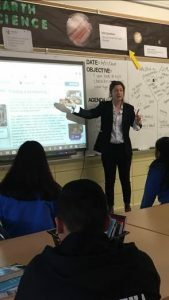 They are also very interested in globalization and issues surrounding refugees in other parts of the world, and together with co-teacher Ryane Hardy, Tanya enriches classroom curriculum with the travelers’ global perspectives. Anticipation buzzes across the blacked-out stage. In the wings, we ready ourselves. After a hundred hours of rehearsal, this moment comes at us at warp speed. Lights up, music on, action! LOVE in Contact was a theater project devised by a team of thirteen individuals from different national, cultural, and linguistic backgrounds, the culmination of six months of exploring love in all its facets. As both a researcher of contemporary migrant, multilingual, and transnational cultures in Germany and a lifelong thespian, I could feel my scholarly and creative sides coming together in ways I could not have imagined when I first began my Research Fellowship at Humboldt University of Berlin’s Institute for German Literature exactly ten months prior. In my dissertation, I analyzed 20th and 21st century German-language novels and memoirs about young migrants and refugees. While my ‘day job’ took place in lecture halls and libraries, in the evenings, I explored the city’s rich cultural offerings, including attending performances of both traditional repertoire and avant-garde productions at theaters such as the Maxim Gorki and Ballhaus Naunynstraße, which produce plays by and for communities from migrant and refugee backgrounds. I also participated in Youngcaritas Kulturbuddys, a group that brings together 18-27-year-old refugees and non-refugees for cultural excursions. When the leaders of that group invited me to participate in a new theater project, I jumped at the chance to transition from scholar and audience member to creative writer and actor. Collaborating with the cast and crew felt like putting theory into practice; it gave me first-hand experience of the kinds of transcultural labor performed by the writers and protagonists I examine in my research, simultaneously enriching my understanding of transnational, multilingual art forms and my own self-understanding as a Turkish-American PhD Candidate in German studies. 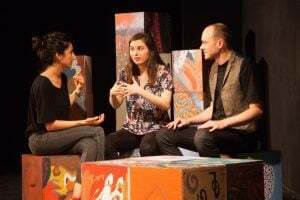 Writing and performing in this production and even helping to create the sets has invigorated my desire to become an active participant in contemporary German culture rather than a mere observer. I also feel encouraged to incorporate the arts in my teaching, scholarship, and activist work so that students and members of the community may feel inspired to make German culture their own. My advice for Fulbrighters about to begin their journeys and for prospective applicants envisioning their grants is to seek out opportunities for community engagement and creative practice, as these are just as vital a part of your role as cultural ambassador as your research and teaching. You can learn about opportunities for engagement by following cultural organizations on social media, scouring your host university’s bulletin boards, reading the arts and culture sections of local newspapers, and even Googling, which is how I found out about Kulturbuddys. Senator J. William Fulbright defined the “essence of intercultural education” as the “acquisition of empathy––the ability to see the world as others see it, and to allow for the possibility that others may see something we have failed to see, or may see it more accurately.” Theater, like all forms of creative expression, can bring people into contact with new perspectives that challenge their own prejudices, hopefully leading, as Senator Fulbright had hoped, to a more empathetic world. So, how will you spend your time off the clock?